My friend recently presented me with a frozen Boston lobster and I thought why not I cook it the Oriental way instead of the normal Western cheesy bake. The dish turned out to be amazingly tasty with a mild tad of spiciness. It’s not hard at all to pep up a noodle dish with the lobster. 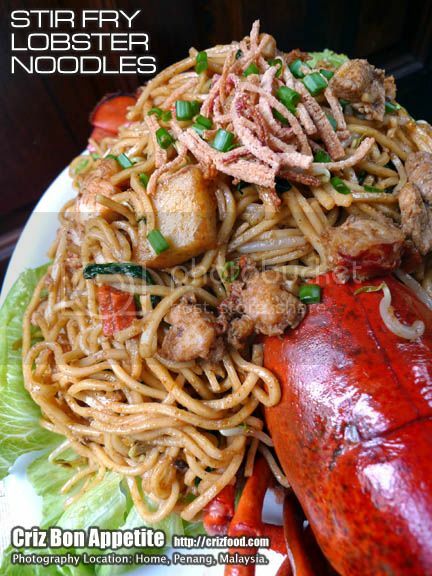 Let me share with you my STIR FRY SPICY LOBSTER NOODLES recipe. Since lobsters do not have much flesh for the consumption of more than a pax, I have added in some prawns, meat and fish cakes to make the bulk. Each individual added items gave the noodles superb flavors. In case you can’t get the ready blended chili paste, just blend all the ingredients below with a bit of water. Freeze the balance until needed. • Heat up the 1.5L water in a wok on MEDIUM-HIGH heat and add in 1 tsp of salt. 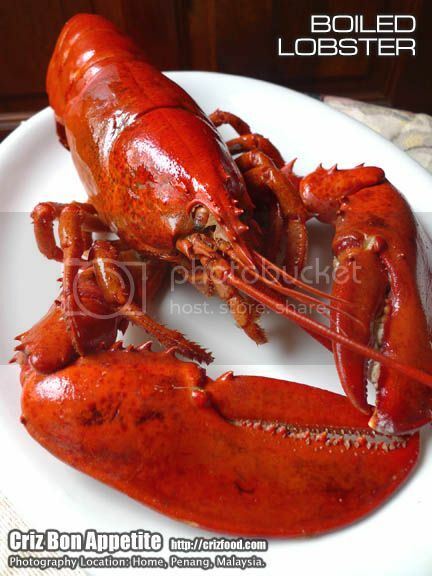 • When the water boils, put in the lobster and cook for about 12-15 minutes. 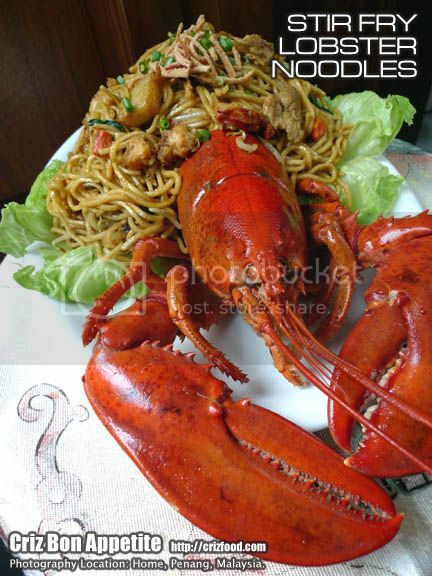 • Remove the lobster and apply some oil on the shell to maintain the shining red color. 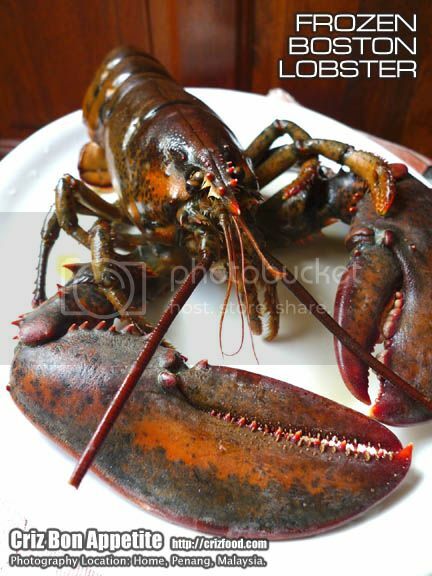 • Take out the lobster flesh and cut into bite chunks. • Sift the boiled stock to be used later. • Heat up 2 tablespoons of oil, add in the chopped garlic and stir fry until fragrant. • Add in 1 teaspoon of chili boh and fry until fragrant. • Pour in the prawns and stir fry until curl. Do not overcook it. Scoop up and cut the prawns into halves. Stir fry again until they are in twisted curls. Add in the boiled lobster flesh and sliced fish cakes. Stir evenly. Scoop up and leave aside. • Add in another 2 tablespoons of oil, 1 teaspoon of chili boh, the sliced meat and stir fry until cook. • In the same wok, add in some more oil and saute the sliced shallot until golden brown. • Add in 4-5 teaspoons of chili boh (depends on your spicy level) and stir fry until fragrant. • Pour in the cups of lobster and meat stock and let it boil. • Add in 2 tablespoons of soy sauce, a pinch of salt and a light sprinkle of pepper to taste. • When the soup boils, add in the morning glory, noodles and stir thoroughly until the soup almost dry. • Add in the bean sprouts and stir until translucent. • Add in the cooked items such as the lobster flesh, prawns, meat and fish cake. Stir mix thoroughly. • Scoop up the noodles onto a serving plate. Garnish with some deep fried crabsticks and chopped spring onions. Enjoy your appetizing noodles~ Good Luck! I wonder where can we get Lobster in Penang?? Any idea?? ?